When I get tired of potatoes, rice, and pasta but still want carbs, I throw some bread into the rotation. 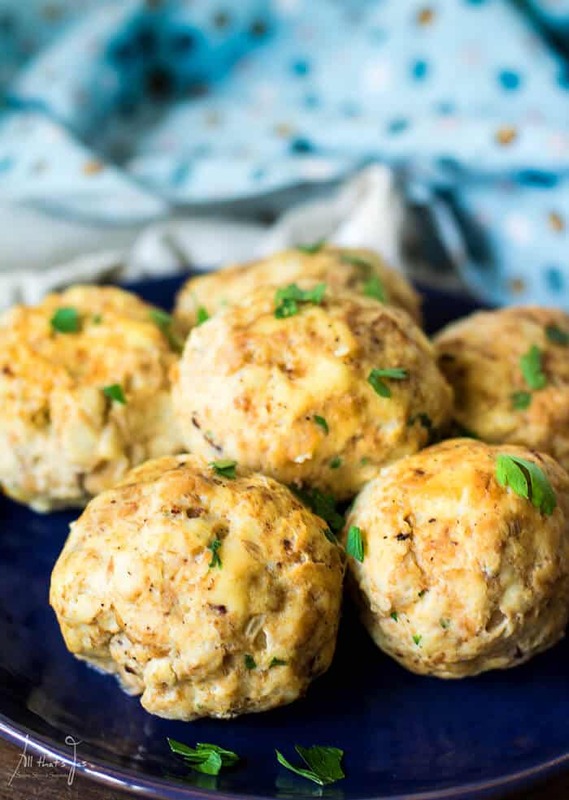 As in these bacon bread dumplings, because everything is better with bacon. If you don’t belong to the masses of bacon lovers (ahem, daughter) you can leave it out. They are good even without the bacon. Originating from Austrian, German, and Czech cuisine, dumplings spread throughout the Europe with variations. They can be made of ground liver (yuck), semolina (to drop into soup), or potatoes (dessert). 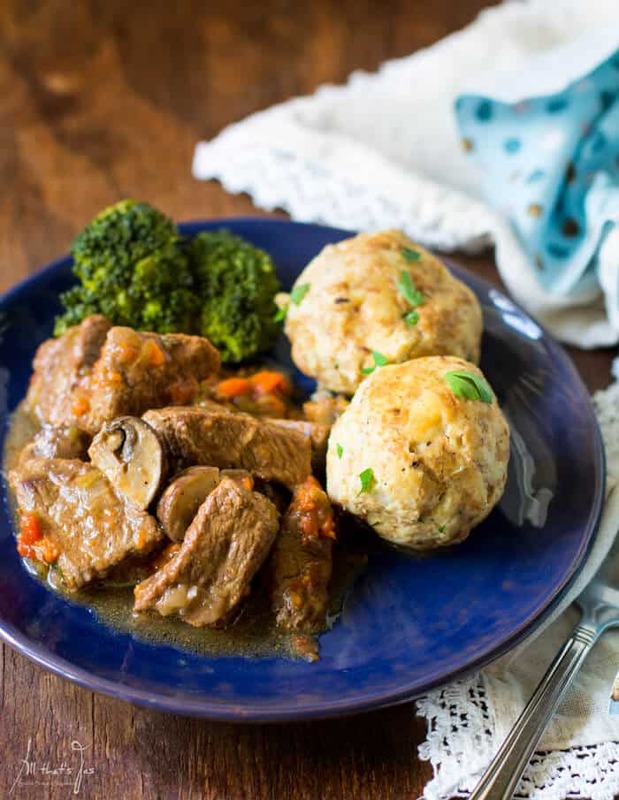 Serve these bacon bread dumplings with saucy dishes, like my red wine goulash you see in a picture below. These puppies are perfect for scooping up meat juices and a good way to use up leftover bread. But don’t limit their consumption with only rich fall and winter meals. They go great with creamy mushroom or cheesy sauces any time of the year. What is your go-to side dish? Melt the butter in a large skillet over medium-high heat. Add bread cubes and toss until golden brown, about 5-10 minutes. Transfer to a large bowl and set aside. Add bacon and onions to the skillet and sauté until browned. Add the mixture to the bread. In a small mixing bowl whisk together the eggs and milk. Pour over bread mixture. Season with salt, pepper, and nutmeg. Add parsley and mix until well combined. Set aside to rest for 10-15 minutes. Bring a large saucepan of salted water to a boil. Moisten your hands and form bread mixture into 6 balls. Add balls to boiling water and cook until firm, about 15-20 minutes. Remove dumplings with a slotted spoon and drain briefly on paper towels. Transfer to a serving dish and sprinkle with parsley. Serve dumplings alongside any meat or mushrooms with gravy or a creamy sauce. 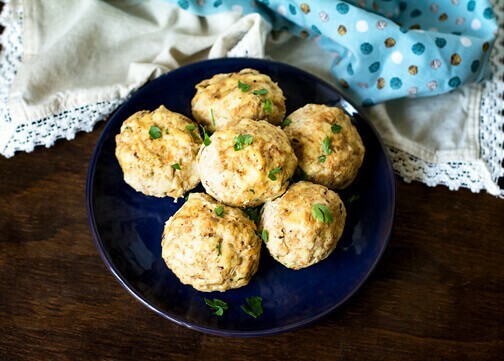 As an alternative to classic side dishes, these bacon bread dumplings are great for soaking up gravy or sauce. 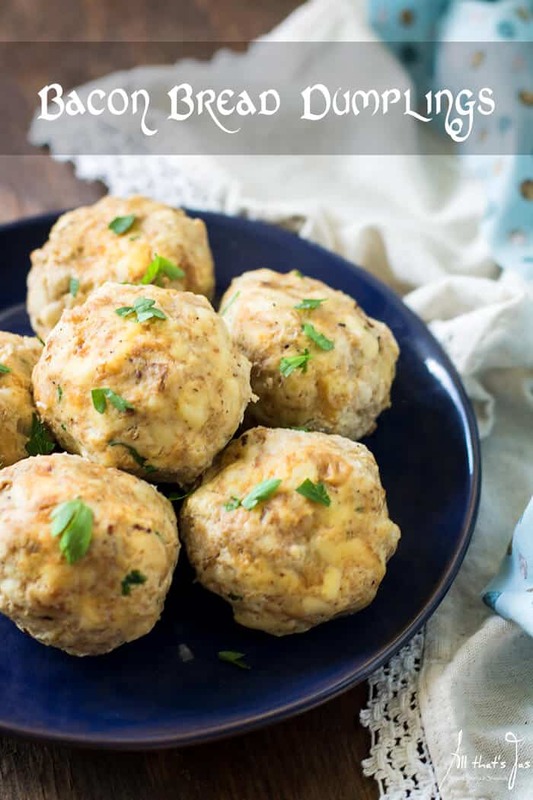 Loving the look of that delicious beef dish with all of those juices and the perfect accompaniment is these little adorable dumpling to soak up those juices. Bacon is one of the main food groups for boys so I am certain this will be on the request menu at our house soon. Sharing everywhere! Thank you, Bobbi! You might want to put in more bacon then, lol. Take care, my friend! My sons would make short work of these! My mom used to make dumplings and I remember them being so so good! These look just like them Jas and I bet they are fantastic! It’s a pretty common side dish in Germany, especially with meat or even in a soup. They look delicious and now I’m craving some, I haven’t had dumplings in years! Just leave the bacon out. That’s how I make it most of the time. Didn’t know we have a mutual friend, hehe. Have you sought out help for your Daughter? Not liking bacon, couldn’t imagine! Of course she will live a much longer and healthier life. :))) Thanks for sharing with us at Throwback Thursday. Pinned! LOL, Quinn! She can’t be helped. Sometimes I wonder how is she mine. When she was little I teased her that a gypsy woman left her on my doorstep, so… 😀 Have a great weekend! Love the recipe. We’d love to try this soon. Thanks for joining us at the Inspiration Spotlight party. There is no way I won’t like these. Three of my favorite words are in the title! Bacon. Bread. And Dumplings! I’ve never had this type of dumpling before and now I am super curious to try one. Thanks for sharing at Throwback Thursday! Beautiful dumplings! I’ve heard of them, mostly in historical town cookbooks, but now I “get it” Thanks for sharing with us this week at Throwback Thursday! I’ve never made dumplings from bread before – they sound delicious! Thanks for sharing on the What’s for Dinner Link up. Of all the ways to use up stale bread, this might be my favorite 🙂 Thanks for stopping in and have a great week! These look delicious, Jas. What a great recipe. Pinning. Thanks for sharing at Snickerdoodle! Thank you, Beverly! Wishing you a lovely week! This sounds delicious, Jas! The only dumplings I make are the kind that are served with Hungarian chicken paprika, as both my parents were Hungarian. I’ll have to share my mother’s recipe some day on my blog. Please do! I’d love to try your mom’s version. Maybe it’s similar to my mom’s, which I also should post someday 🙂 Thanks for stopping in and have a great week! Yum. Jas these look like some that we make in Greece too. We are all related. I wouldn’t put bacon in there either. not because I don’t like it but they seem pretty perfect without. Smart girl your daughter. 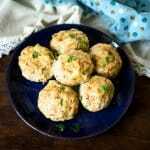 I have only ever had chicken and dumplings, but these do sound and look delicious! Thanks for sharing your recipe with us at the #HomeMattersParty this week. Why stop at chicken, right? LOL. Thanks for stopping in, Nicole!